What is the best length barrel for your Heckler and Koch pistol outfitted with an IMM match weight? I got out my ruler to find out. Jarvis already makes a HK45 Match barrel. It is listed on their site as “HK 45 FS 6.02 inch Match Length(this is not the USP Model)”. 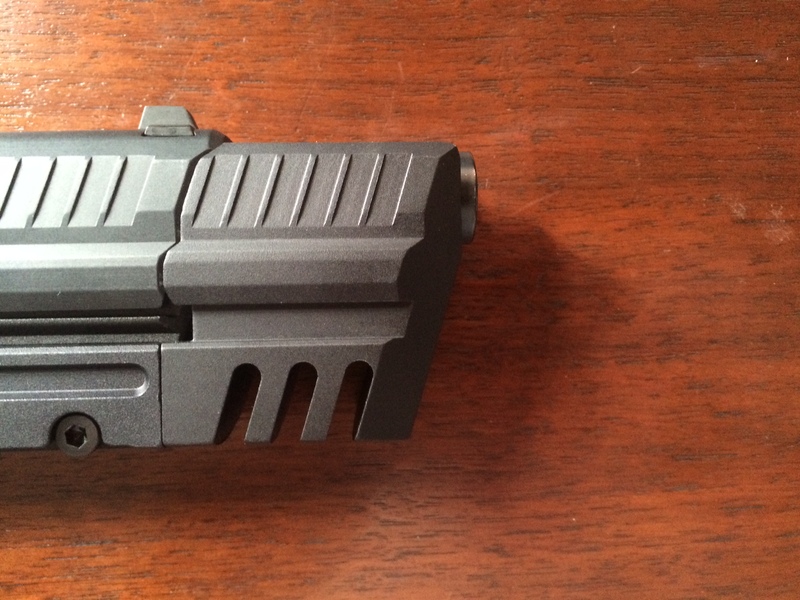 When installed on a HK45 with the match weight it sticks out the front just a tiny bit. 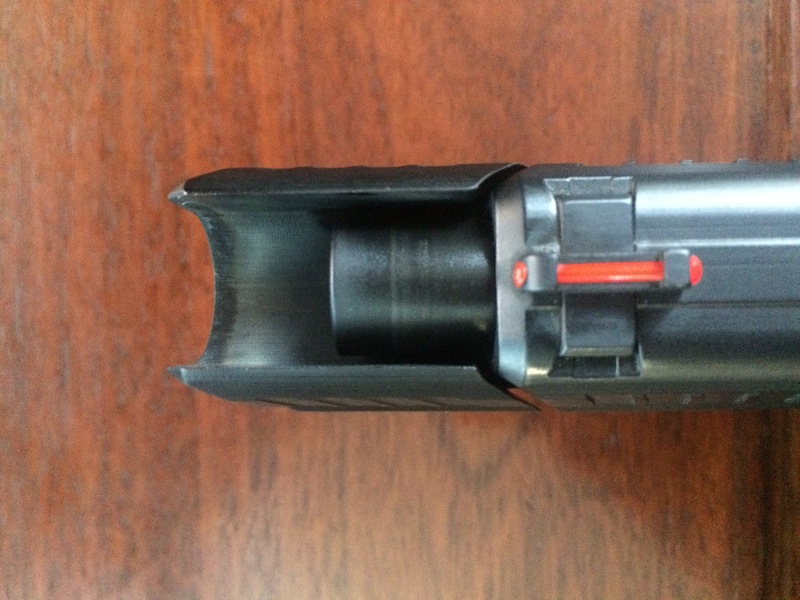 The barrel has an O-ring installed already and fits nicely in the pistol. Jarvis can help you out for 9mm. 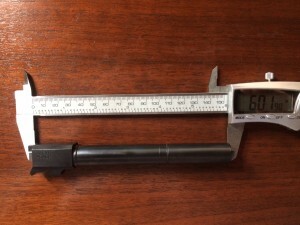 The longest barrel available from Jarvis is “about 5 and a quarter inches” which is pretty close to what is needed for the IMM weight on a P30. A barrel with a total length of 5.2 inches will be flush with the tip of the weight, so a length between 5.2 and 5.3 would be fine. You will likely want to call them up to place your order because exact lengths are not an option on the website. Jarvis does not make HK barrels in .40S&W. I did inquire about adding an O-ring to a P30 or P30L barrel and was told that they do not have an O-ring in that size. EFK Fire Dragon can do a barrel up to about 5.09 inches. This fits the BrownBearGear weight perfectly, but the IMM weight is .1″ longer. EFK Fire Dragon produces barrels in 9mm and 40S&W. So if you shoot a .40, this is your only option that I know of. The options for the P30L are limited. No one that I am aware of makes a P30L barrel long enough to extend the full length of the weight. The barrel would need to be 5.8″ – 5.9″. So the options here are extended ported barrels or threaded barrels, and they will extend halfway into the weight. This will function fine, but lacks the “Finished Look” that I’m sure you are looking for. Jarvis will have this in 9mm, and EFK will have 9mm and .40S&W, or HKparts would have an OEM threaded barrel. The plain truth is that there hasn’t been a demand for the longer barrels for the P30L. The match weights have only been on the market for a short time. Once enough people have asked for a longer barrel, manufacturers will start making them. If you know of other barrel options, drop me a line. IMM weights are in stock and shipping now. Hot off the UPS truck, IMM Match Weights are in stock and ready to ship. Check them out in the store. Now you can add a match weight to your HK45, P30, or P30L. Available with or without an accessory rail for mounting lights or lasers. I am thrilled to announce that we will now be selling IMM holdings match weights for the current lineup of HK handguns. IMM is the company that produced the USP aftermarket weight for years. Now I can offer a match weight for the P30, P30L, HK45, as well as the USP series. The VP9 and VP40 weights are due out soon. The IMM weights will be available soon at $195 with free shipping. Now that the IMM holdings weights are available for sale here, I will discontinue the BBG aluminum match weights. This will allow me to focus on heavy steel weights and some other HK related products that I have in various stages of completion. The P30 match weight is for sale on the webstore. The weight is sized to fit a P30L extended barrel in the P30 slide perfectly. There are a couple options on barrels. Here are the most popular. 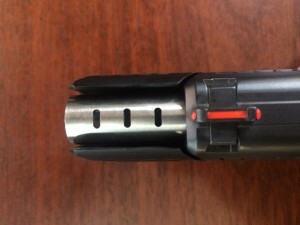 P30L Extended Ported barrel: This is an ideal solution. Already ported, comes in black or stainless, minimal waiting. The ports are not as directional as the weight, so you will burn the sides of the weight, but that isn't anything major. P30L Extended Threaded barrel (with no threads cut in it, special order call EFK and ask for it. ): Perfect solution, but lead time is an issue. I had my barrel ported by MagnaPort to get something that was ported only along the top. Does not burn the weight, but less porting than the EFK Ported barrel so the muzzle flip reduction is slightly lower. P30L Standard Barrel: This will get you by, but dont purchase a P30L barrel for this. Your money would be better spent on a longer barrel. 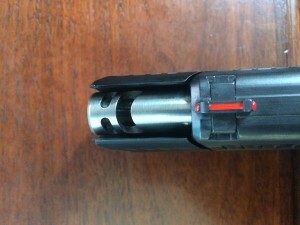 P30 Threaded Barrel: This will work, but the looks of it may not be what you are wanting. The barrel will not reach the end of the weight. P30L Threaded Barrel: This also will work, but the looks of it may not be what you are wanting. The barrel will not reach the end of the weight. Please don't use the Standard length barrel. Flames get directed back into the the weight and may burn the frame of your pistol as well as your knuckles. Plus the blast puts a huge strain on the metal, it may break under sustained fire. We just got the pictures back from the photographer for the HK P30 Match Weight. It really looks fantastic. Check them out in the store.